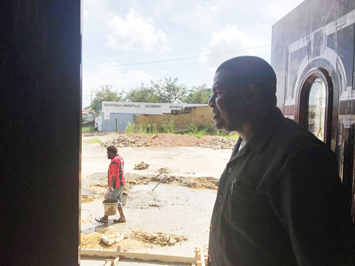 The Black Agenda Building being constructed in Trinidad was spearheaded by the Nation of Islam and other groups and will celebrate a grand opening May 25-27. Trinidad and Tobago, the twin islands and southern-most country in the Caribbean have a population of 1.6 million people—mostly Black and east Indian. 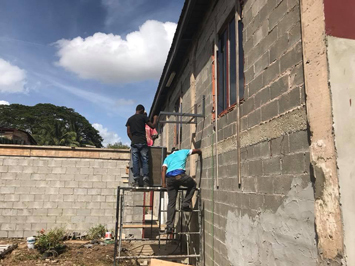 Although Trinidad has its share of problems, the Nation of Islam is helping to address social and economic conditions, issues of education and working with the country’s prison population. “We have a relatively frequent schedule of going into the prisons,” Student Minister David Muhammad said. The Final Call recently interviewed him about progress in the country. Since 2012 he’s served as the Eastern Caribbean Representative for the Nation of Islam and the Honorable Minister Louis Farrakhan based in Port of Spain, Trinidad. “I speak in all the major prisons in Trinidad and Tobago and in some of the schools,” he added. However, the student minister understood early that institution building must take place to service the needs of the people. He said with their active community life and growing the Nation of Islam’s study group, they embarked on land ownership and constructing a major building from the ground up to house the work of servicing the people. The 6,000 square foot structure called “The Black Agenda Building” sits on three quarters of an acre of land in the Success Laventille area. It was independently purchased by people pooling their resources. “No government support, no corporate support; simply conscious Black people coming together, uniting, pooling their resources, establishing a skills bank and think tank, and doing for self,” said Student Minister Muhammad. He said it’s historical because the accomplishment “broke all of the myths and stereotypes” that say Blacks can’t come together and do something. “In recent times our entire mission has been centered around the building project,” he further explained. The Most Honorable Elijah Muhammad, patriarch of the Nation of Islam said the Caribbean would one day rise as a great united nation and with the looks of things his words will be realized. Despite imperialist efforts underway by foreign interests to control and marginalize the region, the Nation of Islam is making progress and is on the move in Trinidad and Tobago. “We have basically, our ‘Unity Family meetings which are our ‘Sunday general’ meetings ... study group classes and FOI and MGT classes during the week,” said Student Minister Muhammad. In addition to the busy schedule of the study group, Student Minister Muhammad also writes a weekly column in the country’s main newspaper; does television programing three days a week and hosts the popular “Black Agenda Report” radio broadcast five days per week. He explained the study group is engaged in issues effecting Trinidadians as a society. By representing the guidance and teachings of the Most Honorable Elijah Muhammad, the group is doing the work of reform and human restoration. 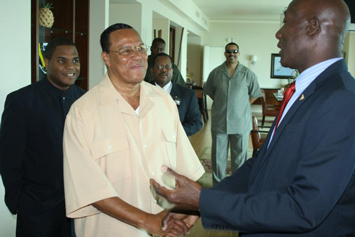 The group has made inroads in influential public spheres where the ideas of the Nation of Islam are being heard. Student Minister Muhammad said they regularly are invited to speak on business and cultural platforms such as annual emancipation events hosted by government ministries, utility companies and public film corporations. The vision for The Black Agenda Building came directly from Min. Farrakhan, said David Muhammad. “It was in the same year that I was appointed the Eastern Caribbean Representative by the Honorable Minister Louis Farrakhan, that he, while in Trinidad … said: ‘We need to open a national savings trust with our people, for the purpose of acquiring land and buildings,’” he recalled. Min. Farrakhan is also a son of the Caribbean—his mother was from St. Kitts and his father, from Jamaica. The group later launched a national fund as suggested by Min. Farrakhan and began searching for available land to purchase. In September 2015 they purchased government-owned land where they constructed The Black Agenda Building. The project was a long and expensive process that required many fundraisers as far away as New York. But the highlight is the grand opening of the Kwame Ture Educational Center which will be housed in the building. The revolutionary was a native of Trinidad and a staunch Pan Africanist who died in 1998 in Conakry Guinee. The educational center bearing Mr. Ture’s name is a significant triumph because he was banned by the government of Trinidad for his uncompromising stance for Black empowerment. Although the project was spearheaded by the Nation of Islam “many groups and individuals assisted in different ways,” said David Muhammad. The building houses the Nation of Islam Eastern Caribbean Headquarters, the Honorable Elijah Muhammad Masjid and the Kwame Ture Educational Center. Student Minister Muhammad added they chose the conference theme to address division and fragmentation that permits other ethnic groups to capitalize on Black people. Part of the work from The Black Agenda Building is to organize and mobilize against Black powerlessness, lack of self-support and distrust of one another. Imam Yasin Abu Bakr also from Trinidad, will conduct Jumu’ah Prayer (Friday congressional prayer) service on May 25. Nation of Islam representatives to Caribbean nations will be on hand as well as Abdul Hakeem Muhammad, NOI Representative to Europe, and Patrick Muhammad, Seventh Regional Representative which includes Florida, the Caribbean, Central and South America are also scheduled to speak.